In wastewater treatment, aeration is the process used to dissolve air into water. It enables growth of aerobic bacteria on key pollutants such as biochemical oxygen demand (BOD) and ammonia during treatment. Yet, there are limits to aeration. The air we breathe contains only 21% oxygen. Adding more oxygen to the wastewater has several benefits. “Pure oxygen” describes a gaseous mixture containing more than 90% oxygen. Pure oxygen aeration is based on the idea that pure oxygen increases the capacity for wastewater treatment in a given aeration tank volume. Additionally, because the use of pure oxygen avoids the compression and stripping of large amounts of nitrogen, the power requirements and emissions are lower than in regular aeration. Adding pure oxygen aeration to wastewater treatment processes increases the capacity of existing aeration tanks, saves energy and lowers emissions. Pure oxygen aeration is well suited to floating aerators with a high oxygen transfer efficiency capability, such as RWL Water’s Tornado, an aspirating aerator that combines aeration and mixing below the wastewater’s surface. Its adjustable angle makes it one choice for the aeration of lagoons. The Tornado offers pure oxygen capabilities thanks to its design: It has a large-diameter draft tube with unrestricted air intake, and a pure-oxygen supply line can be attached directly to its air intake opening. RWL Water’s partnership with Praxair, a supplier of industrial gases and application technologies, offers end-users a way to implement pure oxygen aeration. 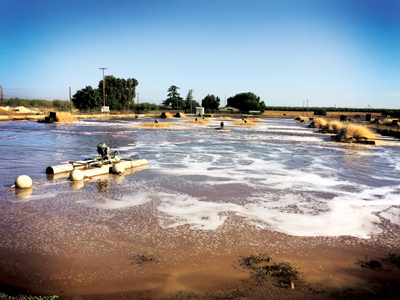 One example of the use of pure oxygen aeration is the city of Escalon, Calif.’s industrial wastewater treatment facility. The facility uses Tornado aerators with pure oxygen to provide supplemental aeration in its lagoons. The seasonal plant, located in San Joaquin County, treats industrial effluent from local tomato and pickle processing facilities. During the harvest season, effluent dissolved oxygen (DO) levels from the aerated lagoons often were lower than the required level. The facility was threatened with closure if it could not comply with DO requirements. This challenge led to the imposition of production limits on the processing facilities and a plan to truck wastewater to the nearby city of Manteca. At the same time, high power costs and restrictions on the amount of power available at the site limited the ability to supplement aeration with conventional aeration systems. Because the lifecycle cost of aeration with pure oxygen is typically no less than conventional aeration, pure oxygen aeration should be considered to address specific issues, such as capacity limits, low DO issues, odor, emissions concerns and power restrictions. In the right situations, pure oxygen aeration can provide an attractive total cost of ownership, and address some of the most important challenges facing wastewater treatment facilities today. Randall B. Marx, Ph.D., P.E., is a business development professional for water applications for Praxair Inc. Marx can be reached at [email protected] or 630.320.4476. Nii Mensah is vice president and general manager for RWL Water. Mensah can be reached at [email protected] or 763.746.9277.